Members of Gov. 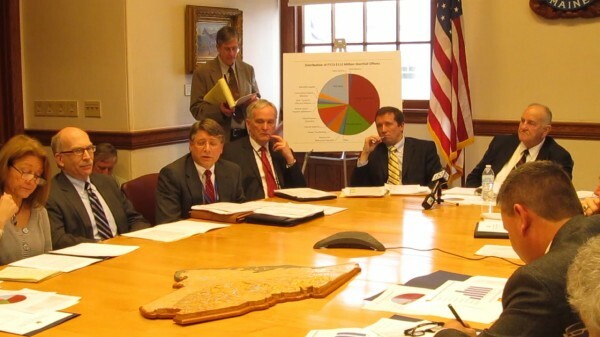 Paul LePage's cabinet present LePage's biennial and supplemental budget proposals on Friday, Jan. 11, 2013, in Augusta. LePage did not attend the presentation. Members of the Legislature study budget documents provided by Gov. 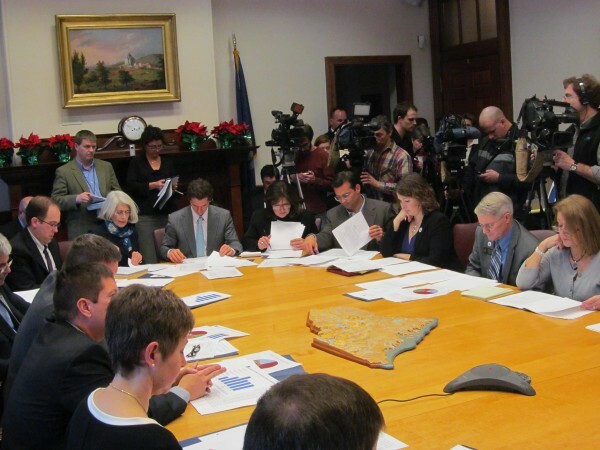 Paul LePage's administration on Friday, Jan. 11, 2013, during the unveiling of LePage's $6.3 billion biennial budget in Augusta. AUGUSTA, Maine — Funding for public schools and higher education will remain flat in the next two years if Gov. Paul LePage’s $6.3 billion biennial budget proposal makes it through the Legislature unscathed, though members of education organizations said they are gearing up to fight many of the budget’s provisions. While Education Commissioner Stephen Bowen said the budget demonstrates the LePage Administration’s priority on education, others said the middle class will suffer, particularly local taxpayers who will see more of the burden for their schools shifted to their property tax bills. The proposed biennial budget seeks to fund K-12 public schools for the next two years at the same level as the current year on the heels of a $12.4 million cut that LePage ordered in late December to balance the current year budget. That means General Purpose Aid will remain at about $895 million in each of the next two years. About $13 million in new education funding will flow to Maine schools outside of GPA to support new initiatives enacted by the Legislature in recent years, including a new accountability system supporting underperforming schools, implementing a new teacher and principal evaluation system, and supporting schools that are developing a new standards-based system for awarding diplomas. There is also additional funding for adult education, career and technical centers, students who want to take college classes in high school, Jobs for Maine Graduates and the growth of a program long-favored by LePage that would allow high school students to attain community college degrees in five years of high school. LePage, who was not involved with presenting his budget proposals to lawmakers and the media on Friday, promoted his budget in written comments. The budget also includes a proposal to have school districts statewide pay for 50 percent of present and future teacher retirement contributions. Currently, state government pays 100 percent of teacher retirement contributions to the Maine Public Employees Retirement System. Bowen said that change will cost local municipalities a total of about $14 million a year, though the impact on individual towns will vary based on a formula that involves a range of factors including property values. It means that richer school departments will be expected to pay a higher percentage of teacher retirement costs, while poorer ones will pay less. Kilby-Chesley said LePage’s budget will ravage municipal budgets. She said flat funding for local schools doesn’t account for increasing expenses and will force school boards to either make cuts to programs or go to their municipalities for more revenues. She also decried LePage’s proposal for school districts to pick up half the statewide cost of the teacher retirement system. In a separate supplemental budget proposal that deals with the current fiscal year, which ends in June, LePage proposes to delay the state’s June general purpose aid payments until July, which essentially means part of this year’s budget will be paid next year. An effort led by former Sen. Richard Rosen, director of the new Office of Policy and Management, to identify $10 million in new savings initiatives in the coming years, will help pay for the $18.5 million cost being pushed to fiscal year 2014. University of Maine System Chancellor James Page said in a written statement that he appreciated LePage’s “commitment to higher education in Maine.” LePage proposes spending $512 million on higher education in the next two years, which represents flat funding from the current year. Education spending, as well as the rest of LePage’s budget proposal, will be the subject of intense scrutiny by the Legislature and its committees between now and June. Senate President Justin Alfond, D-Cumberland, reacted with concern to what he saw as a pattern within the budget documents of shifting costs to property taxpayers.